Melanoma is a kind of skin cancer. 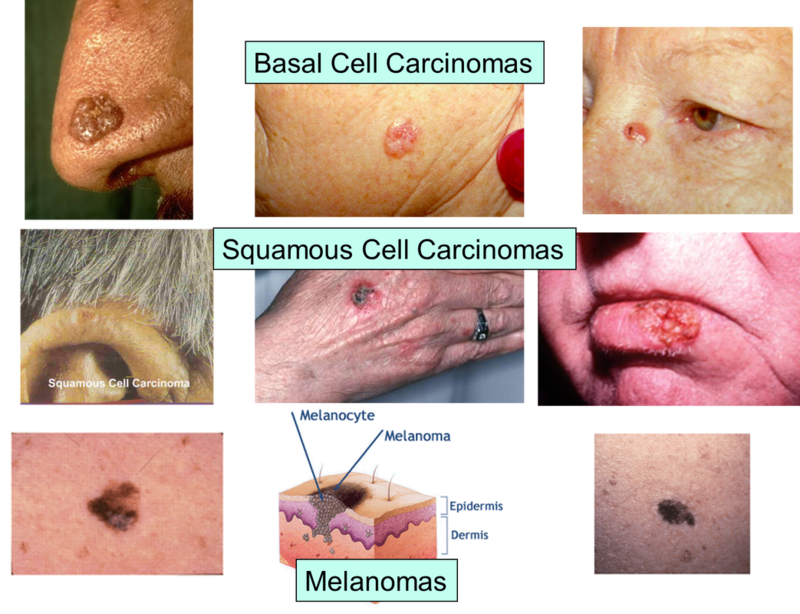 It is not as common as other types ofskincancer, but it is the most serious. Melanoma can affect your skin only, or it may spread to your organs and bones. As with other cancers, treatment for melanoma works best when the cancer is found early. What causes melanoma? You can get melanoma by spending too much time in the sun. Too much sun exposure causes normal skin cells to become abnormal. These abnormal cells quickly grow out of control and attack the tissues around them. Melanoma tends to run in the family. Melanoma may grow in a mole or birthmark that you already have. But melanomas may grow in unmarked skin. They can be found anywhere on your body. Most of the time, they are on the upper back in men and women and on the legs of women. In order to catch any disease early, you must be aware of your body and notice skin changes. This is a Body Mole Map. Use this map to locate all the moles on your body and jot down their location. Check this map once a month to ensure none of your moles have evolved into melanomas. Doctors use the "ABCDE's" acronym as a tool to diagnose possible melanomas. When using your body map, take into consideration your ABCDE's. E) Evolution - the mole has changed over time. If your melanoma is very deep or has spread to your lymph nodes, your doctor may talk with you about taking a medicine called interferon. Or your doctor may recommend that you enroll in a clinical trial. The best way to prevent all kinds of skin cancer, including melanoma, is to protect yourself whenever you are out in the sun. It's important to avoid exposure to the sun's ultraviolet (UV) rays. Try to stay out of the sun during the middle of the day (from 10 a.m. to 4 p.m.). Wear protective clothes when you are outside, such as a hat that shades your face, a long-sleeved shirt, and long pants. Get in the habit of using sunscreen every day. Your sunscreen should have anSPF of least 15. Look for a sunscreen that protects against both types of UVradiation in the sun's rays-UVA and UVB.